You are not a disorder, you are a person. We are body, soul and spirit. We must bring healing to our own “Trinitarian” being (in the sense of being body, soul and spirit). Traditional therapy either wants to give pharmaceuticals or just discuss and manage symptoms of anxiety, thoughts or behavioral issues or perhaps to do all three but not to actually bring healing and restoration for the “whole” person. Christ says He makes all things new. He promises us healing. Was He lying? Are we expecting too much? Are we giving the cross or God too much power? I say no. I say we do not expect enough. I believe Christ really has the power to work miracles. In fact, He worked miracles of healing and told the apostles that they would do all of the things He did and more! We are called to bring healing and deliverance to those in misery, to be a sign of His power. Christ desires to restore us. Our healing is to be a visible sign to the world that our God is an awesome God and that He Reigns in Heaven and on earth. He makes us whole. I believe he wants to heal our emotions and our memories, not just our bodies. We are not disorders. 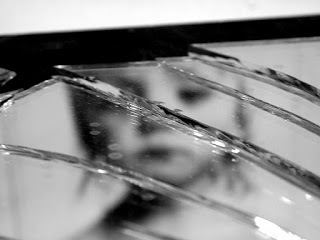 I believe many people who have been sexually abused or experienced traumatic childhoods like I did are actually dealing with identity wounds that distort their ability to know themselves and to know God. Being abused has a very real and powerful effect on shaping our identity. To merely dismiss that and label someone as being “disordered” is, in my opinion, causing more damage and in a sense, keeps their pain and cries for help unheard. I realize we can categorize and diagnose and give our psychological disorders a name but what good is it to give it a name if you do not understand it enough to help bring healing? 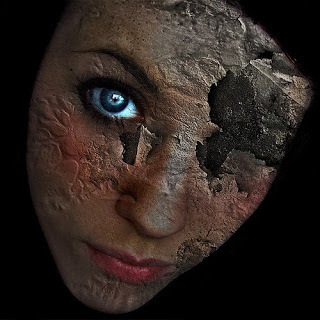 Many of our disorders come from identity wounds. How do we get identity wounds? We get them when our true identity is distorted by shame. It may sound contradictory to say there is such a thing as “good shame” but in fact there is good shame and bad shame. Good shame is felt when we are separating ourselves from God as well as others in a selfish way. It “prickles” our conscience and in this way it helps us to address a something we are doing that we know is wrong so that we can self-correct. This “prickling” of conscience is from our awareness that we have just separated ourselves from what is good and true. This not only helps us shape our morality but it also protects our self-respect. When we feel “good shame” we become aware that we have lost our innocence, motivates us to correct ourselves and turns us back to what we know is good. Bad shame is more of an emotional torment and sickness to our very soul. It is what begins to poison and divide us from within our whole self. All of us have shortcomings and when they are used to ridicule us or to inflict “bad shame”, we tend to believe the lie that we are bad or unworthy and this new “truth” sears into our heart, mind and soul. We believe the lie that we are inferior, unworthy, undeserving and bad to the bone. Bad shame causes us to despair separating us from our only cure to what ails us, which is God’s mercy. The inflicting of this debilitating shame comes from those closest to us and causes the deepest of wounds. When we are children, our beliefs are being shaped, especially our beliefs about who we are as persons. If the message we get is that we are bad or unlovable, it can become our identity. Identity wounds distort our ability to love ourselves, to love others and to love or know God. the worse thing we can do to a person with identity wounds is to give them an identity as being “disordered”. Lets think about the word “disorders” through the lens of Theology of the Body. For something to be disordered it has to have been rightly ordered but then gotten twisted up. When the John Paul II wrote about Original Man he reminds us that in Genesis that Adam was naked without shame. He had no desire or intention to use Eve as an object of pleasure for his own selfish needs or wants. They were both subjects of God and saw one another as persons. When sin entered the garden they were no longer seeing one another as subjects but as objects. They covered their “private parts” of their bodies in shame. What was good and right became disordered due to sin. This is the reality of the world we live in. If this is true then we see we are all disordered in one way or another. If we are all disordered in some way how helpful is it to give a person made in the image and likeness of God a label of being disordered as if this is their identity or who they are as a person? I am guessing it could be potentially destructive and could create further woundedness. Let’s call disorders what they truly are, which is distortions of truth from which we base our lives and relationships upon. We are complex human beings. The teachings of Theology of the Body helps us to get a bigger picture as to who we are as persons and how we are made to love and be loved as self-gift whereas psychology bases “truth” in disorders or distortions. Our experiences in and through our bodies shape our understandings and beliefs and those beliefs can bind us up. We act on our beliefs and if those beliefs are disordered it goes to follow that so too may our actions be disordered. For example when I experienced the trauma of being sexually abused it created a deep wound that penetrated my identity, which distorted my whole “person”. Psychology may have helped me to understand the distortions and behaviors but Theology of The Body helped me to understand my wounds and their effect on my identity. It was this distorted identity that shaped my beliefs and those beliefs caused me to make the choices in my life that I did. Looking at someone’s whole person, body, mind, emotions, memories, spirit etc is what needs to happen if we want a person to reclaim their greatness. Seeing the whole person as opposed to a disorder is what gives true hope for healing. Anything else merely treats a part of a person. Christ comes to make all things new, not part of things new. Last week was the feast of Immaculate Conception as well as the Feast of Juan Diego and Our Lady of Guadalupe. About a year ago, I had an encounter with the image of Our Lady of Guadalupe that changed the way I understood who and what Mary is, how God loves the world and our place in this plan of Divine Providence. I was in Philadelphia at the Theology of The Body Institute and was invited to dinner with a couple, Ryan and Lisa, who lived nearby. At dinner we visited and shared our journey as parents of large families, homeschooling and more. I liked them both instantly. All at once, Lisa asked me if I ever looked closely at the image of Our Lady of Guadalupe. I had to confess that I did not, after all I have always thought that this image was just a picture of the blessed mother as she appeared in Mexico, nothing more, nothing less. Boy was I in for a huge awakening. She left the room and returned with a votive candle, you know the ones that have images on them? This one had an image pasted on the outside of Our Lady of Guadalupe. She proceeded tell me that one day when she was looking at the image, she discerned what looked like a line on the inner gown that was comparable to that found on a pregnant woman’s belly called a linea nigra. This is darkening of the skin due to changes in hormones, that spans from the bellybutton to the pelvic area and is quite common to women who are expecting. As I looked at the inner robe, I experienced a profound insight to the image that took my breath away. Not only did I see what she was seeing, but I saw even more. I saw how the entire inner robe looked like a torso, but not any torso. It looked to me that of the torso of Christ. Right down the center of the torso is the line which is in the very fabric of the Tilma itself. This is thought by many experts to be the exact center of the original image, as it has been cut to fit frames over the years, thus changing the shape. If I followed the line, indeed, there is a dark area of where the bellybutton would be, the line going down, then leads to a shadowed area that looks like two thighs coming together in the pubic area. As I followed the darkened line up from the bellybutton, I saw that just to the right of it, where the heart shaped flower is (and where one would expect a heart to be inside of a body), I saw the punctured heart of Christ, there is even a curved line like that of the flow of water and blood coming from the the heart and curving into the the folds just under the 4 petaled Jasmine flower that is a glyph of truth and for the one true God. I was flabbergasted. Right in front of me, I was seeing the torso of Christ, whose arms extended upwards and become her arms, as if symbolically they were conveying that they are united in purpose ending with her pinkies crossed in the St. Anthony cross. I also noticed how only four of her fingers show on each hand just like the shroud of Turin does of the crucified Christ, another Holy image said to be a miraculous image. I have since taken both images and overlapped them and discovered other beautiful coincidences. Upon leaving the couples home that evening, they gave me a book about the image of Our Lady of Guadalupe to read. I stayed up most of the night reading it. I am sure some of you are shaking your heads at me saying, “You didn’t know that it was a codex or a language in picture form to the Nahuatl Indians?” Nope, but I did now and I was beginning to get a whole lot more. 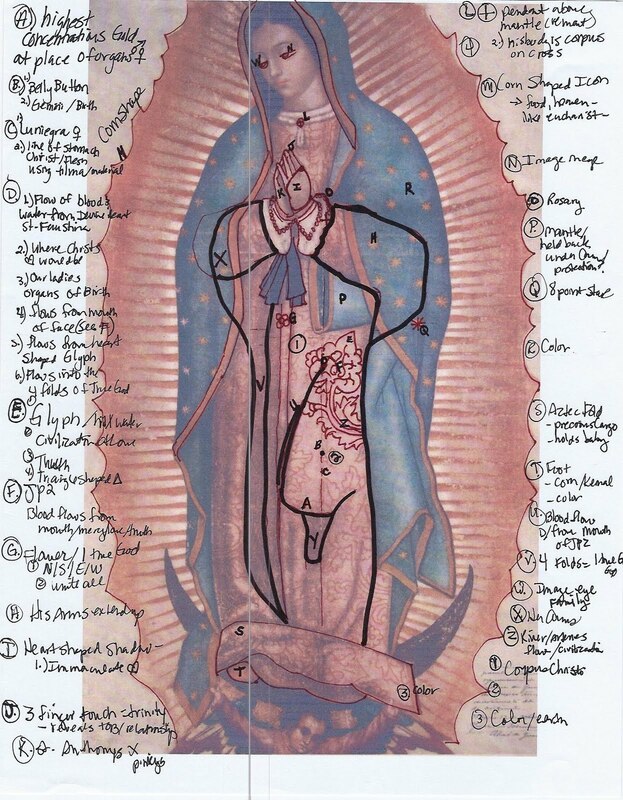 As I read through the Handbook of Our Lady of Guadalupe I began to decipher the codex with the lens of Theology of The Body. Something was happening, I started seeing a message related to our own times. I began to see a new purpose revealed within the image and it was a message to the world that we were created for love. This message was filled with divine mercy and it’s grace that was literally emanating off of the picture as I gazed at Our Lady of Guadalupe. The glyphs within the image, spoke a language in codex form to the Nahuatl Indians. This message signaled an end to human sacrifices and that a new civilization had arrived (the shape of the heart conveyed hill or mountain, the “stems” of the flower were a glyph for river or water and together they revealed civilization) for in this image was revealed that she was bringing the one true God, which was greater than any of their gods (she blotted out the sun, thus the rays coming from behind her). The glyph of the face of the “wise man” which can be seen within the 9 large heart shaped flowers spoke another truth to me. Since I believed that the curved line emanating from the heart shaped flower glyph was that of the font of Divine Mercy, (after all it came from the heart just like the Divine Mercy image and it also originated from the belly of Our Lady where the incarnate Christ was inside of her womb) the rest of the revelation came to me in a tidal wave of thought. What if the face of the wise man was John Paul II who not only canonized St. Faustina, thus giving the message of divine mercy to the world, but what if this “new civilization” was about making our hearts right, untwisting them, putting a “person” or face into our own hearts so that we would not objectify others as he wrote about in Love and Responsibility and in Theology of The Body. Even her name, “Guadalupe” she shares with the name of Our Lady of Guadalupe in Spain, traditions says was carved by St. Joseph and painted by St. Luke. The Icon is titled “The Queen Of Mercy” because she protected those who sought her intercession. The Divine Providence alone begs the question…Why was OL Guadalupe the Icon in Spain, the icon that in the 5th Century saved St. Gregory Great, in the 7th Century saved Bishop Leander in Spain, preserved the faith there and upon it’s discovery after Mary appeared to a farmer, a church was built there in which later St. Isabela would consecrate her reign and Columbus, Cortez and Bishop Zummaraga would all visit this same church and consecrate their lives and their work to Our Lady of Guadalupe. Why? Unless the preservation of the faith is some how tied to Mary through this particular title and this particular Icon. In the image from Spain, she is a mother, holding the Christ child. In the image in Mexico, she is a mother expectant with the God incarnate. The mercy of God, the reason for Him becoming man. Our Lady of Guadalupe spoke these words to Juan Diego on Tepeyac hill “Am I not here, I who am your Mother? Are you not under my shadow and protection? Am 1 not the source of your joy? Are you not in the hollow of my mantle, in the crossing of my arms? Do you need something more? 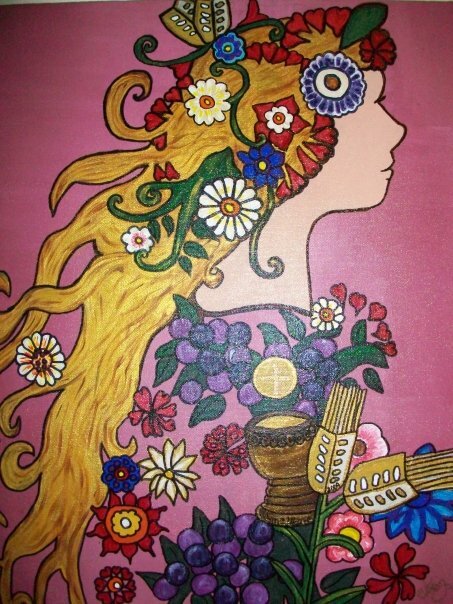 Let nothing else worry you or disturb you.” She is the source of our joy. She also called herself our merciful mother. What is in the hallow of her mantle? Christ’s mercy, God’s love demonstrated in the incarnation. No wonder we are told to place ourselves within the hallow of her mantle because this is where the trinity is. More miraculous findings have been revealed within the past century. For instanct, in her eyes, using high powered microscopes and computers images of St. Juan Diego, the Bishop and others have been found in her eyes. It is an interesting side note that her eyes display a triple reflection (Samson-Purkinje effect) characteristic that is found in a living eye. In one of her eyes a discovery of a man and woman with several children are found, representing a family. I find the images of the family strangely reminiscent of the themes of JP2’s pontiff. If the family is seen in Mary’s eyes, this reveals much to us about the future of the “church” since Mary is the mother of our church and we are her church. “The family is the domestic church”. The meaning of this traditional Christian idea is that the home is the Church in miniature. The Church is the sacrament of God’s love. She is a communion of faith and life. She is a mother and teacher. She is at the service of the whole human family as it goes forward towards its ultimate destiny. In the same way the family is a community of life and love. It educates and leads its members to their full human maturity and it serves the good of all along the road of life The family is the “first and vital cell of society”. In its own way it is a living image and historical representation of the mystery of the Church. The future of the world and of the Church, therefore, passes through the family.” Homily of Pope John Paul II November 30, 1986. John Paul II brought us these messages in Theology of The Body and Love and Responsibility. Within them, he desired to share with us the relationship of God, which is the trinity (father, son and Holy Spirit). The trinity reveals profound theological truths to us about who God is. We are called to “know” God. Just as scripture says “and Mary knew not man” this knowing is one of intimacy and relationship and is how God desires to “know” us (union and communion). JP2 desired to reveal that each one of us are called to this union and communion. JP2 also worked tirelessly to share the dignity of all life and our call to love freely, fully, faithfully and fruitfully. This is how we would know, love and serve God so that we could enter into union and communion with God not only in Heaven but right now on earth. I believe all of these truths are revealed in this image. I have begun to read every book that I can on the image of Our Lady of Guadalupe. I have come to see many things in the glyphs, in the codex, in the icon like image of Our Lady of Guadalupe. What is the most important thing that I believe is revealed in the image? I would have to say the most important image I see is overwhelming symbols of the trinity. God the father (creator and giver of life, expressed in her receptivity of motherhood) so loved the world that He humbled Himself and became Man (incarnation of Christ in her womb). God the son, (revealed through sash signifying pregnancy as well as the torso of Christ seen in the inner robe)so loved the father that He gave Himself as a gift back to the Father(the flowing blood and water from the pierced “heart” comes out of the “mouth” of the glyph of the wise man found inside of the heart) the flow of blood and water cascades down the 3 folds (symbolic of the one true triune God?) just under the 4 petaled jasmine flower (truth, God) showing us that the Father received the gift of the son. This love was so complete and full that it became life-giving (the three folds as well as the fact that her pregnancy is a result of being overshadowed by the power of the Holy Spirit). 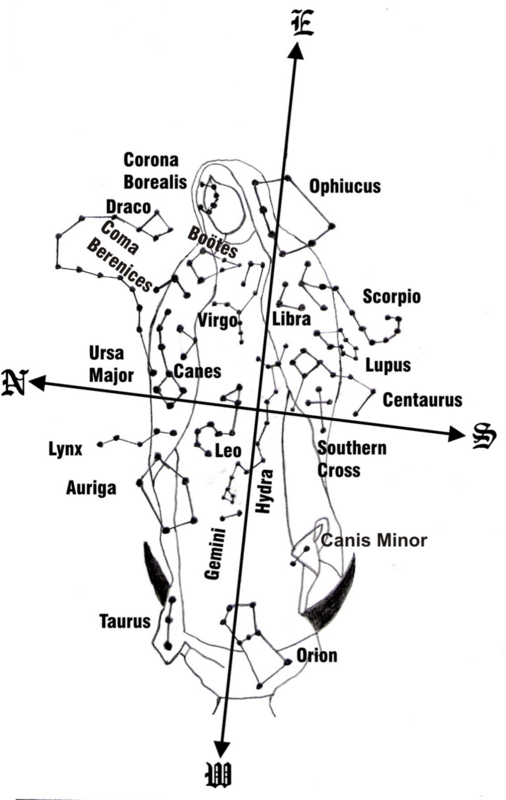 Interestingly, the constellation of Gemini, the twins, is located on his torso indicating this profound truth that God made the body that made His body. 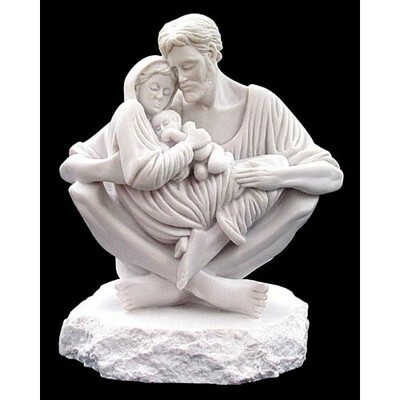 They are flesh of the same flesh, united in purpose conveying union of purpose and love as well as communion since not only does every participle of her DNA exist within Christ but she is also carrying his infant form within her womb, giving him the blood and water in which to give Him life. He then reciprocates by giving us his blood and water in which to bring us all, through his mercy into the next world. Eve, was brought into the world through the gift of himself and through the flesh of Adam she came to be. Now the New Adam, through the self-donation and gift of the New Eve, will receive His flesh from the flesh of Mary. So it would seem that God really does make all things new. In the beginning, Eve in her no, of her own free will, took, with her no to God and in doing so she brought the fruit (knowledge of Good and Evil) of death into her body and subsequently brought death to all of her offspring. All is made new when the New Eve, Mary, of her own free will, gives herself as a gift and in doings so brings into her body the fruit of life and of all knowledge, into her body and subsequently brought life to all mankind. Mary is the ark, she is the first tabernacle and we see her her standing on the moon as if it were a patent, suspended by an angel that venerates her. I found many “secrets” that at first I thought were secrets, but now I have found that there are Saints and mystics that have been saying this stuff for the past 2,000 years! In fact, I am encountering many people who are being drawn to Icons and Iconography right now. They are drawn to Our Lady of Guadalupe like never before and there are people that are being drawn to find ways to use art to communicate truths of the Christian faith to the people of the world that are so lost and broken right now and falling under the weight of their own weaknesses that they are thirsty, desperately thirsty and desire hope and desire to encounter a living God! Indeed we are created for love. I hope your Christmas season is filled with the revelation that God is with us and He came to be with us physically in the flesh of mankind so that we might participate in the salvation of mankind through our gift of self. It is in our yes, that we are able to bring Christ to others. Caryll Houselander taught me that. In the image of Our Lady of Guadalupe, God reveals that there are no lengths in which He would not go to reveal His love to the world. There is a battle for souls being waged around us. The veil is thinning and there are many who are discerning that something, is coming. Are you ready? The Church Militant must engage themselves in this battle. Each of you have been given a particular gift, charism or expertise that will change the tide and ensure our victory. 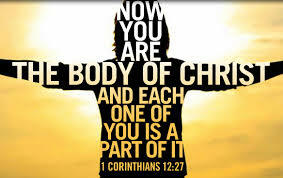 We need each other as the mystical body of Christ to join forces and defeat the enemy of the Church. After realizing that there are all of the resources we need to turn the tide of the battle, I thought it best to provide a place that the Church Militant can go to find all of the ingredients, tools, resources and inspiration in one spot. While I am sure there are many places out there that have similar links to this or that, this site is intended to not just to connect you to the people you know of, but to introduce you to the people you do not. When we put all of our resources together into one big pot, we will not have a complete meal to sustain us, but to feed others as well. I am going to be compiling a list of people and resources and ask that they provide me with any new insights, updates or news that will help us formulate the battle plan as well as the tools to carry it out so that we are victorious in re-crowning Christ the King of the World. The preparation time is short, but we already know who wins in the end, so join me as we grow in strength and number. If you come across a resource that is related and believe should be shared her, please leave a comment and I will look into it! May Our Lady of Guadalupe Hide and Protect us.